User-centred Community Engagement - Developing the methodology — eclipse experience Ltd. This page illustrates how the community engagement methodology was developed in partnership between Eclipse Experience and Save the Children UK. The process was a novel experience for all team members and involved learning about user-centred principles on the one side and about humanitarian responses on the other. Whilst it was key to follow a user-centred approach, the unique settings in which the methodology would be implemented presented a challenge for its development. As a first step we defined the primary user group of children aged 5 -12 years, due to their vulnerability and often high open-defecation rate, and their primary caregivers. We also decided to focus on informing the designs of latrine and handwashing facilities. This part of the process was focussed on sharing knowledge and experience between different members of the team. For the Save the Children team members this meant learning about user-centred approaches, and for Eclipse learning about the emergency WASH sector and the humanitarian response processes. We developed the first iterations of the engagement across the early stages of a humanitarian response. Eclipse led this process by iterating the components of the methodology and how they might fit into a rapid-onset emergency response.For this process we worked on the basis of a set of clearly defined assumptions across dimensions such as current humanitarian working practice, logistics and field team capacity. These served as a stimulus that fuelled conversations with Save the Children in which assumptions were tested and the methodology updated accordingly. This allowed Eclipse to gradually learn more about the humanitarian space and the team to finalise the methodology for the pilots. Simple enough for field staff who are not trained researchers to pick up and deploy. Interactive so it is engaging for children and caregivers. Activities that help break barriers between potentially different ethnic groups in the camps. Activity design helps to explore data from Digital One in more detail. Incorporates voting elements to inform decision making. The HIF ran a workshop to help shortlisted teams answer open questions and iterate their approaches. Here the team was able to engage with the Research & Evaluation Partner (Oxfam), address any open questions from the design process so far and better understand the ethical implications of implementing a user-centred approach in a humanitarian emergency. We defined the relationships between each activity in the community engagement process over the course of 12 weeks and planned each in detail. 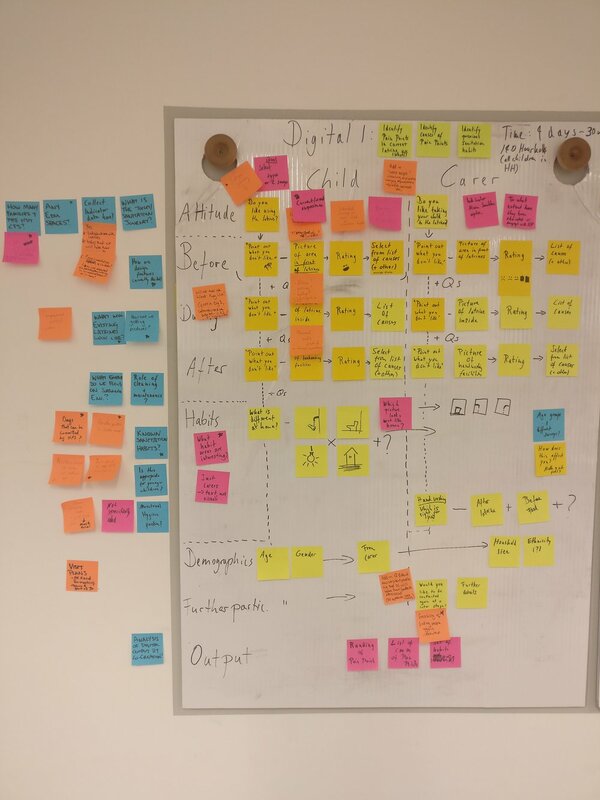 In collaborative sessions, we designed and iterated the questions for the Digital Tool, decided which illustrations we should include and planned the activities of the co-creation session. Throughout this process we checked the activities against the consideration we defined previously and against feasibility in the field. With the methodology ready for deployment and testing in context, we started planning implementation. The ever-changing state of responses was a challenge, with little certainty whether a pilot would go ahead in the chosen countries. The team prepared the logistics and travel arrangements as much as possible before travelling to Bangladesh in December 2017 and Iraq in February 2018. Banner - HIF dev. meth. Body - HIF dev. meth.